US Futures + Asian markets were all lower on the session today, however Australian stocks rallied – the ASX 200 up by 40pts – closing on its highs - thanks largely to strength in the Iron Ore price - Iron Ore Futures up strongly on the session which propelled Fortescue Metals (FMG) up through the $8 handle - Rio Tinto (RIO) now looks more comfortable above $100 per share & BHP is knocking on the door of $40. A pretty phenomenal move with many saying there is more left in the tank! 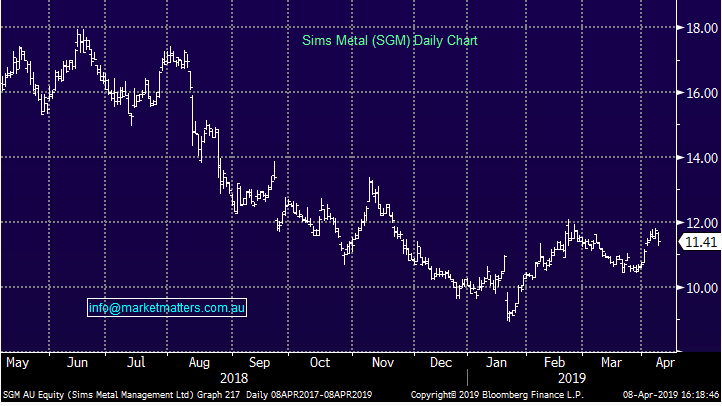 Iron Ore – Citi the latest out with a bullish note on Iron Ore saying it should be above $US100/t over the next 3 months before it track down to $US80/t on a two year time frame. – current benchmark is around $US94…While the mkt has now turned extremely bullish the bulk commodity, the story is around supply, and the speed at which Vale can come back on stream the main game. 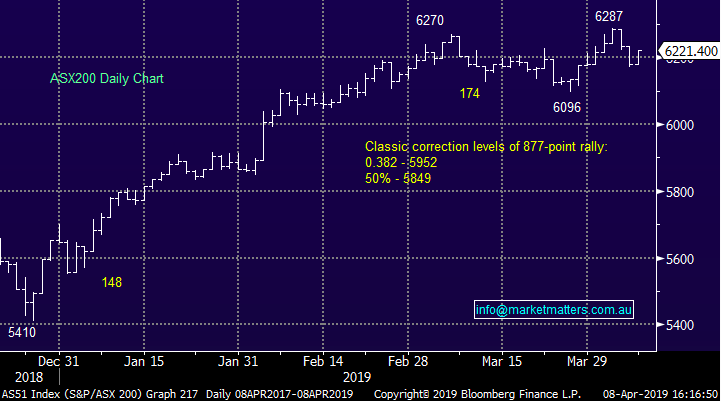 A big week for commodities and recent strength in Crude may be tested with the OPEC report due on Wednesday while Chinese trade figures for the first quarter are out later in the week. Trade negotiations are clearly center stage from a headline perspective, however we’ll get a better feel for how this is actually impacting imports of iron ore, copper, coal – obviously important for Australia but more so a reflection of the actual strength or otherwise of the Chinese economy. 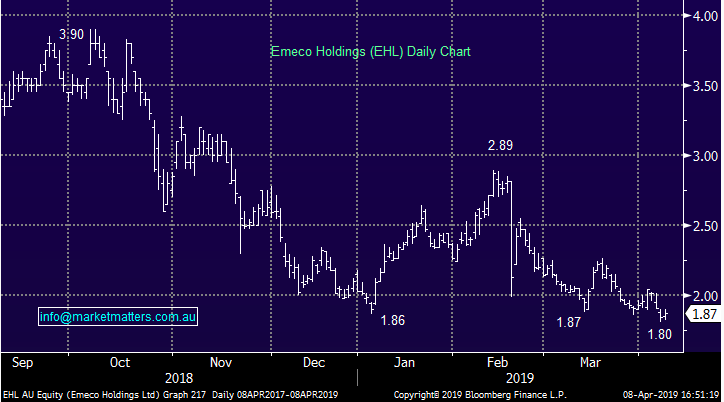 Emeco (EHL) +1.63%, A stock we had a few questions on this morning after Eley Griffiths sold 500k shares last week to take themselves below substantial, however by the look, they still hold around 15m shares. The stock was weak early however there seems to be decent buying when it moves into new lows – today that was $1.82 before buyers pushed it back to a $1.90 high before settling at $1.87. This is the weakest link in the Platinum Portfolio currently – after flagging it at $2, but chasing to $2.18 to get filled. 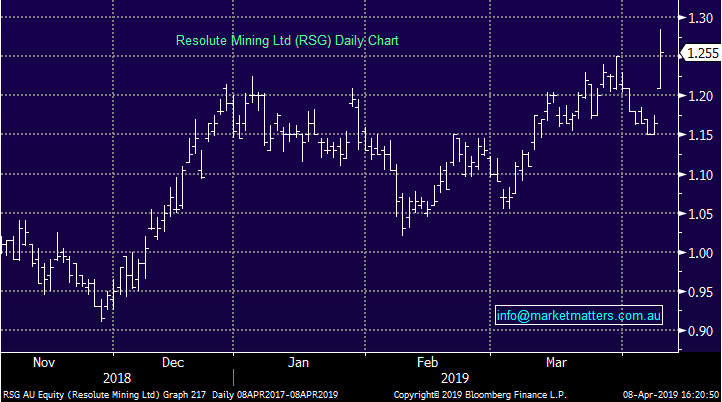 The small gold play in Resolute Mining (RSG), +7.73%, led the way on the local market today thanks to an impressive quarterly update. Resolute’ s quarterly production jumped 33% thanks to a ramp up in production out of its Syama mine. The company is continuing to reinvest into the mine, increasing automation across the production line, all funded by cash flow in the quarter. It noted it is on track to hit production and cost guidance for the full year. 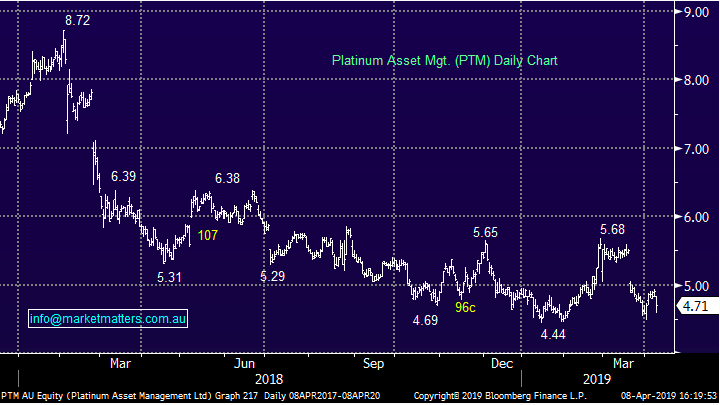 Platinum Asset Management (PTM), -4.07%, hit today despite that market trading higher thanks to a disappointing FUM update the company snuck through late on Friday. 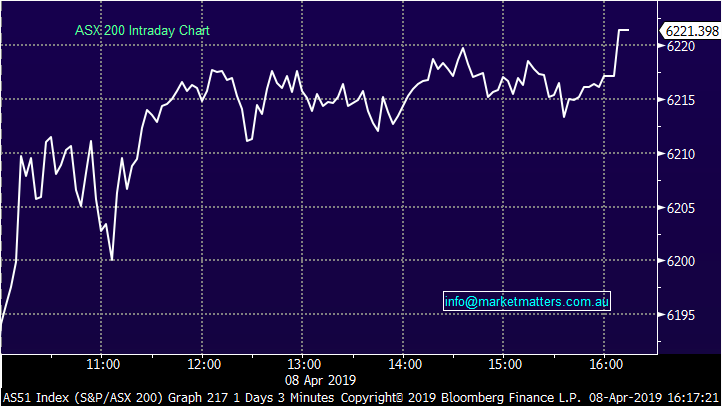 The manager saw net outflows of around $230m for March according to an announcement posted late on Friday, equal to around ~1% of total funds under management, resigning the manager to the third consecutive month of outflows as underperformance shakes investors. Despite the outflows, FUM grew 0.12% thanks to the investment performance over the month. The manager saw net outflows of around $230m for March according to an announcement posted late on Friday, equal to around ~1% of total funds under management. Despite the outflows, FUM grew 0.12% thanks to the investment performance over the month. Broker Moves: Property related stocks were hit today after MQG downgraded Domain Holdings (DHG) on lower forecasted listing volumes… the broker shifted April volumes lower on the back of Easter & ANZAC day alongside school holidays, and failed to definitively call the month as the bottom of listing volumes. Hard to argue with the caution here, although Domain will also see some counter cyclical benefit of relisting volumes which help support earnings in a down market. Stay up to date with the latest news from Market Matters by hitting the 'follow' button below and you'll be notified every time I post a wire. Market Matters publishes daily market reports and sends SMS alerts when we transact on our portfolio. 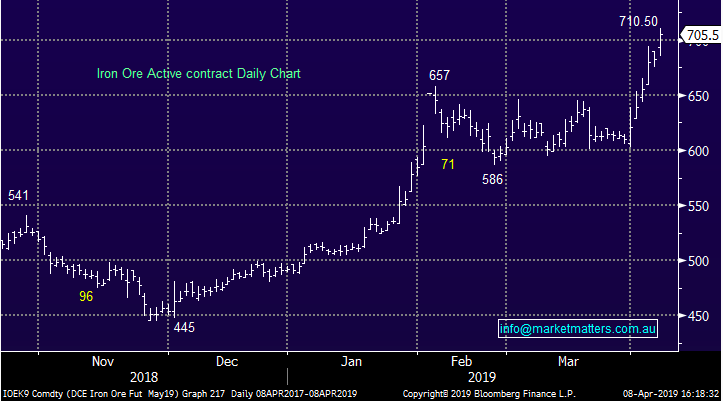 To get our latest market views and hear when we take new positions, trial Market Matters for 14 days at no cost by clicking here.